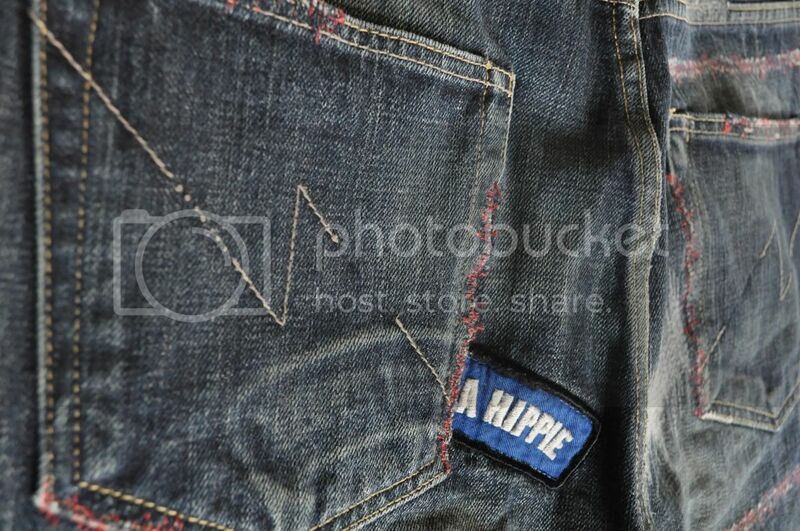 'Never Trust A Hippie' declares Neighborhood's 2009 S/S savage jean. Called Anchor Savage, presumably because of the anchor stitched under the front left belt loop, this pair of denim utilizes contrast stitching and scarring effects as opposed to the tonal stitching used in previous savage entries. 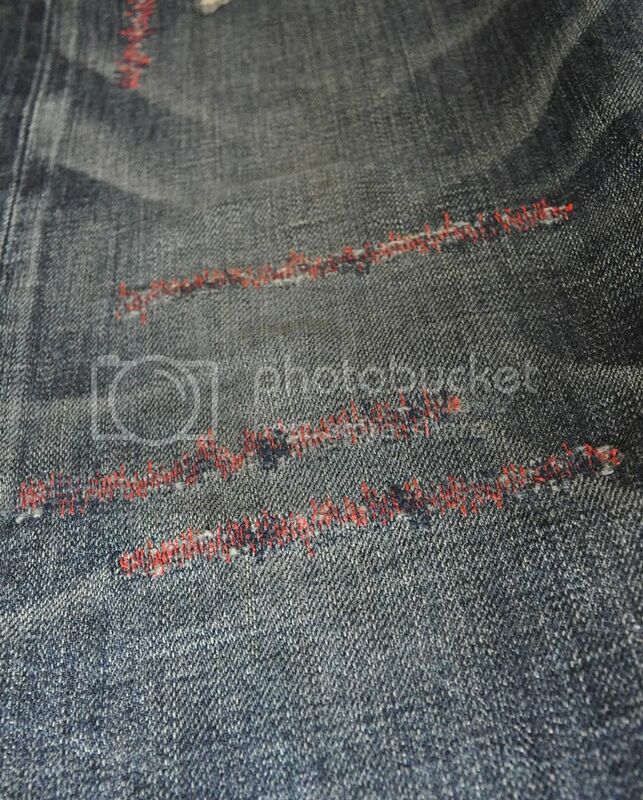 The red stitching on indigo denim was at first a turn off for me, however, because of the Anchor Savage's great looking wash as well as their availability in the deep mid cut, I acquired a pair just a few weeks ago. Take a detailed look at the Anchor Savage by clicking on the link below. 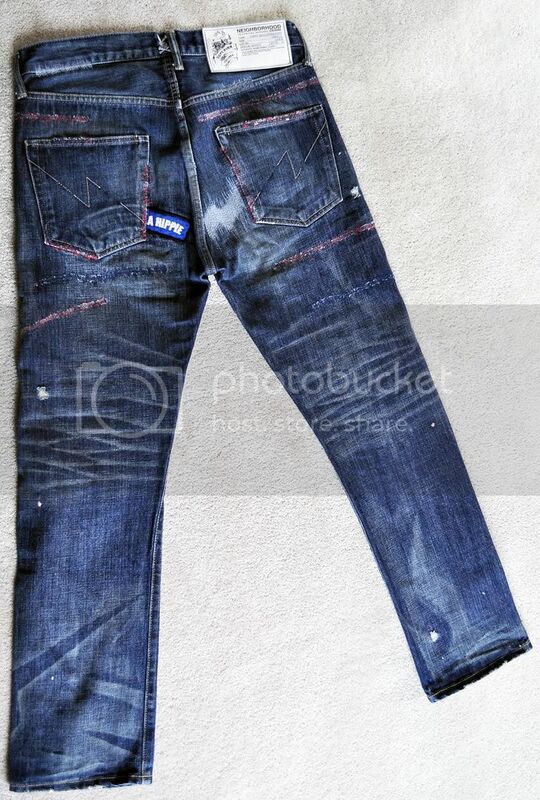 As mentioned above, this pair of jeans changes the traditional NBHD formula of tonal effects by using red stitching on indigo denim (the black pair uses a blue stitching). The red color is not too bright to make the denim look odd, and blue stitching is worked in with the red to make it look more natural. 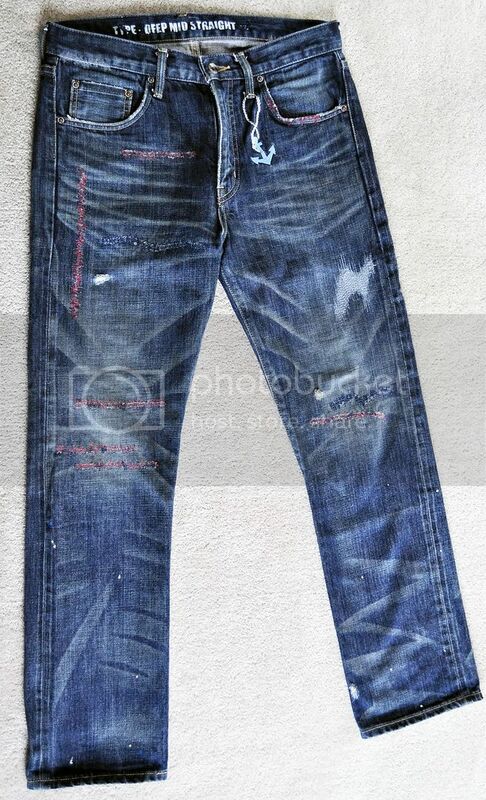 The wash is definitely a highlight on these jeans, especially after the 2008 Dirt Savage which proceeded this pair was largely a disappointment. Emphasis is on the details as usual, with reinforced stitching, pocket details, embroidery and selvedge 14oz Japanese denim. The Deep Mid cut is one of my favorites. Sized appropriately, the cut offers a slim tapered fit that gives more room in the seat and crotch than the Narrow cut. Unfortunately for fans of the more modern cuts, Neighborhood has returned to offering their savage jeans in only Narrow, Mid, and Basic cuts. For those fans who like the Deep Mid and Deep Narrow cuts, you are limited to the raw and washed styles. I ended up getting size S in the Anchor Savage Deep Mid, and though the waist (about w32) and cut fits perfectly, the length is a bit short (about L30). They'll be great during the spring and summer though when I can roll them up for a more cropped look.